Vodka means different things to different people. For a bartender, it’s just one of the staples that is there to make all sorts of mixed drinks, along with gin, rum, tequila, and pickle juice. If you’re someone who just likes to unwind after a long day, alcohol feels like your salvation. Whatever it means to you in the context of your life, vodka is something that is seriously underutilized. There are all sorts of household uses for vodka that will have you loving it even more than you already do. And that’s saying something, considering that you already have a shrine to vodka right in the doorway of your home. You likely know that alcohol is really good at killing infections. And you also likely know that vodka is a type of alcohol. So by the transitive properties of booze, vodka is really good at killing infections. While most people only really apply this principle to skin infections that form around cuts and bruises, why not take it one step further and use it to attack internal infections as well? Next time you have a stomach bug that is making you throw up everything you have eaten in the last decade or a nasty cold that is making your head feel like it is going to give birth to little baby brains, just go ahead and chug some vodka! If it kills those microorganisms in your cuts, why wouldn’t it help kill the infection that’s making your life a living hell right now? Of course, there is the off chance that the vodka will just make things worse, interact with your cold medicine, or dehydrate you when you really need fluids. But if it could help stop that infection in his tracks, isn’t that a risk that is worth taking? You love swimming more than anything else in the world. That outdoor pool is the whole reason you bought your house, even though it is across the street from a monkey cemetery and you have that odd neighbor who painted the interior and exterior of his house bright red just to scare people. That swimming pool was literally worth all of the stress in your surroundings. It is big and spacious and a great place where you can unwind after stressful days at the toenail necklace factory. The only thing is, you forgot to put chlorine in it for a couple of years, and now that swimming pool has turned into a cesspool. It is full of all sorts of dead leaves, insects, even a raccoon carcass here and there. That pool is in dire need of a disinfectant. Knowing that vodka is great at disinfecting things, why not try pouring one or a few or a thousand bottles into your pool? Even if it doesn’t work, you’re bound to swallow some water when you’re swimming in that nasty pool, and given that the water is now part vodka, being in there will be a lot less unpleasant! 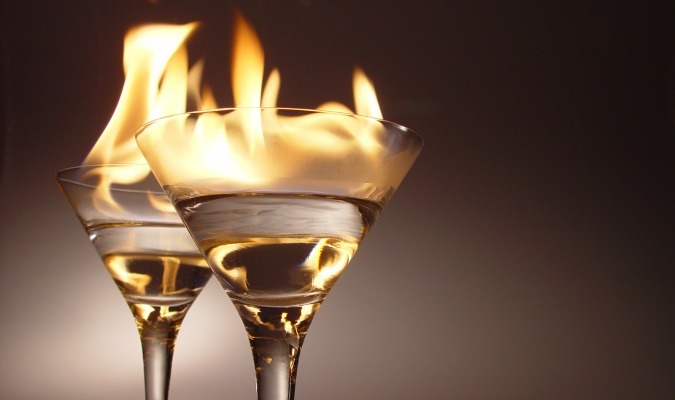 You may think that alcohol warms you up. And it feels like it does. That’s why all those crazy college kids get drunk before jumping into freezing water when their teams win games or when they are trying to complete initiations into those weird clubs that call themselves by Greek letters. But the truth is that your body is lying to you in those situations. It might as well be telling you that apples are a type of cardboard box. Actually, even though your body feels warmer, alcohol actually takes heat away from your core. So instead of using it to create fake warmth on a cold day, why not use it to cool yourself down for real on a warm day? Sure, it’ll feel like you’re just heating yourself up and dehydrating yourself, but you’ll know that you’re actually cooling yourself down, and that should count for something very important. If you are a big drinker, you likely know that alcohol often goes in the freezer. And a great thing about it is that it doesn’t solidify when it’s in the freezer. It just becomes really, really cold liquid. So what you can do if you have neighbors who aren’t particularly impressed by you is invite them over and pour a bunch of water for them to drink. The kicker is that it’s not really going to be water that you’re pouring. You’re going to be pouring vodka! And you will pour an extra glass of “water” for the neighbor whom you know is not actually going to show up because he’s too busy refinishing his bright red shutters. Then, when he doesn’t show up, you’re going to put that glass into the freezer for later. A couple of hours later, while your neighbors are sitting around your living room and talking about pink elephants and blue bamboo, you will take that extra glass of “water” out of the freezer. Before they actually see what’s in the glass, you will run your hands over it and tell them that you are unfreezing it with your hands because you have magical powers. Then, you’ll show them the moving, swishing liquid. They’ll be so zonked out from the alcohol and the conversation about colored animals and plants that they will totally buy it and be completely in awe of you for the rest of time. What’s Worse: A Really Runny Nose Or Really Bad Breath?